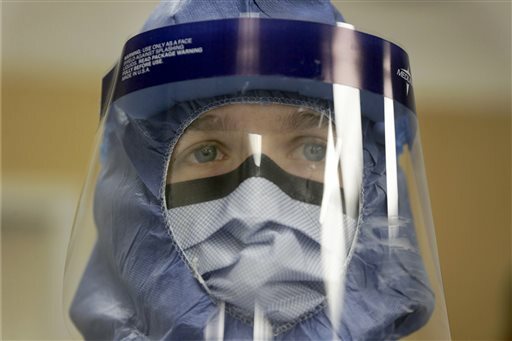 ATLANTA (AP) — Federal health officials on Monday issued new guidelines to promote head-to-toe protection for health workers treating Ebola patients. Officials have been scrambling to come up with new advice since two Dallas nurses became infected while caring for the first person diagnosed with the virus in the United States. Workers at Texas Health Presbyterian Hospital were trying to follow earlier CDC guidance. Organizations representing nurses and other health workers have pressed the CDC, saying the old advice was confusing and inadequate, and health workers felt afraid and unprepared. It’s not clear exactly how the two nurses at Texas Health Presbyterian Hospital became infected, but clearly there was some kind of problem, said Dr. Tom Frieden, director of the Centers for Disease Control and Prevention. “The bottom line is the guidelines didn’t work for that hospital,” Frieden said, in announcing the revised guidelines Monday evening. Earlier CDC guidelines had been based on a model of how to treat Ebola patients in Africa, which sometimes has occurred in tents. They also allowed hospitals some flexibility to use available covering when dealing with suspected Ebola patients. The new guidelines set a firmer standard, calling for full-body garb and hoods that protect worker’s necks; setting rigorous rules for removal of equipment and disinfection of hands; and calling for a “site manager” to supervise the putting on and taking off of equipment. They also call for health workers who may be involved in an Ebola patient’s care to repeatedly practice and demonstrate proficiency in donning and doffing gear — before ever being allowed near a patient. And they ask hospitals to establish designated areas for putting on and taking off equipment, whether it’s a room adjacent to an Ebola patient’s room or a hallway area cordoned off with a plastic sheet. The CDC cannot require hospitals to follow the guidance; it’s merely official advice. But these are the rules hospitals are following as they face the possibility of encountering patients with a deadly infectious disease that a few months ago had never been seen in this country. The CDC guidance was expected as early as Saturday, but its release has been pushed back while it continues to go through review by experts and government officials. All this stems from the case of Thomas Eric Duncan, a Liberian man who came down with Ebola symptoms last month while visiting Dallas. Duncan went to the hospital on Sept. 25 but was not tested for, or diagnosed with, Ebola. He returned to the hospital three days later and on Sept. 30 tested positive. Duncan’s case led to the monitoring of about 50 people who came in contact with him before his second trip to the hospital, and dozens of health care workers who cared for him after his admission. Some good news this week: The 50 in the initial contact group have passed a 21-day observation period and no longer are deemed at risk for coming down with the dreaded disease. Youngor Jallah spent the past three weeks confined to her small apartment with her children and boyfriend, fearing they had contracted the deadly Ebola virus from Duncan, who was her mother’s fiance. But with the household emerging symptom-free from the incubation period, Jallah’s family members are now trying to resume their lives – replacing the personal belongings incinerated in a cleanup at her mother’s home, and overcoming the stigma of the Ebola scare that has gripped Dallas. There are now about 120 people in Texas being monitored for symptoms, with their wait period ending Nov. 7, said Dallas Mayor Mike Rawlings. He said the number may fluctuate. There are also about 140 people being monitored in Ohio because of contact or potential contact with nurse Amber Vinson, Ohio officials said. Vinson, who cared for Duncan in Texas, flew from Dallas to Cleveland on Oct. 10 and flew back Oct. 13. An Ebola patient who was being treated in Atlanta since early September was released from Emory University Hospital on Sunday after he was determined to be free of the virus and no threat to the public. Hospital and health officials never released his name, in keeping with his family’s wish for privacy. Health officials said they were relieved as the monitoring period ended for many, and after a cruise ship scare ended with the boat returning to port in Texas and a lab worker on board testing negative for the virus. After Duncan was diagnosed with Ebola, Jallah’s 13-year-old son, Troh, Duncan’s nephew, and a family friend were ordered by a Dallas court to stay inside the apartment among Duncan’s used linens. Five days later they were evacuated to a four-bedroom home in an isolated corner of a 13-acre gated property owned by the Roman Catholic Diocese of Dallas, southwest of downtown. The city of Dallas announced Monday it is coordinating with a local church and donors to provide Jallah’s mother, Louise Troh, with funds to pay for six months of housing. Once she chooses a location, nonprofits will assist the family with furniture, linens and other household items, the city said. “We want to restore what’s lost but more than that, we want to give her a running start on her new life,” said Troh’s pastor, George Mason of Wilshire Baptist Church in Dallas. While health workers cleared Jallah of having Ebola, the disease’s stigma lingers — including among fellow Liberians, she said. “If they see me at the store, they run away,” she said. Schmall reported from Dallas. Associated Press writers Jamie Stengle, Nomaan Merchant and Marilynn Marchione in Dallas contributed to this report.